Paula and her siblings (coincidentally called Melanie and Nicholas!) commissioned a portrait of Tobi who sadly died a few months previously for their mum Sharon Eggers (Australia). It was a complete surprise for Sharon and the wonderful letters she has written below are a must to read. Sharon took a lot of time taking photos of the painting and very kindly set the camera up so she could be with the painting too and this is a wonderful addition to our website. We cant thank Sharon and her family enough. We are very much looking forward to meeting them next year when they visit the UK. Clients are always welcome at our cottage! 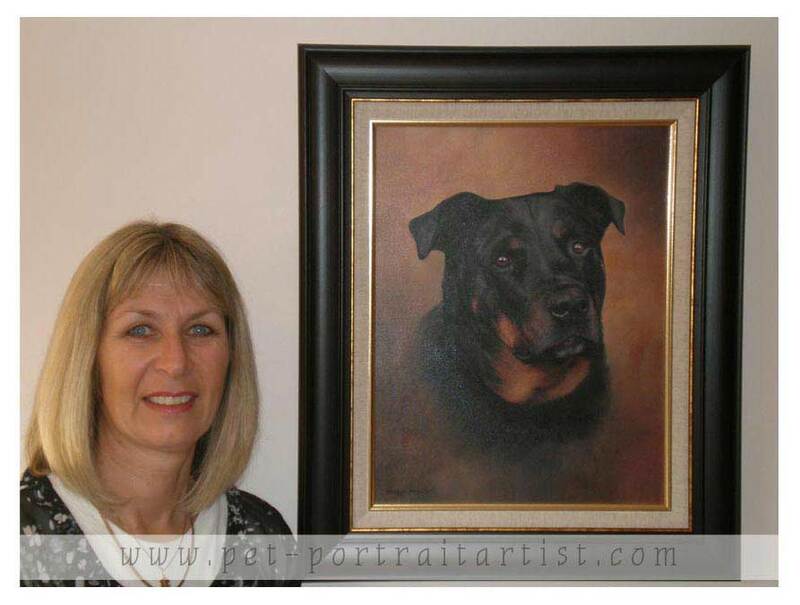 Thank you so much for the magnificent portrait that you painted of my precious Rottweiler, Tobi. It is all the more meaningful for me because my children conceived the idea of such a gift and conspired to get it for me for my birthday and also because Tobi died suddenly 4 and a half months ago. I have put a comment on Tobi’s blog on your website and I would be delighted if you used it as a testimonial to your work. 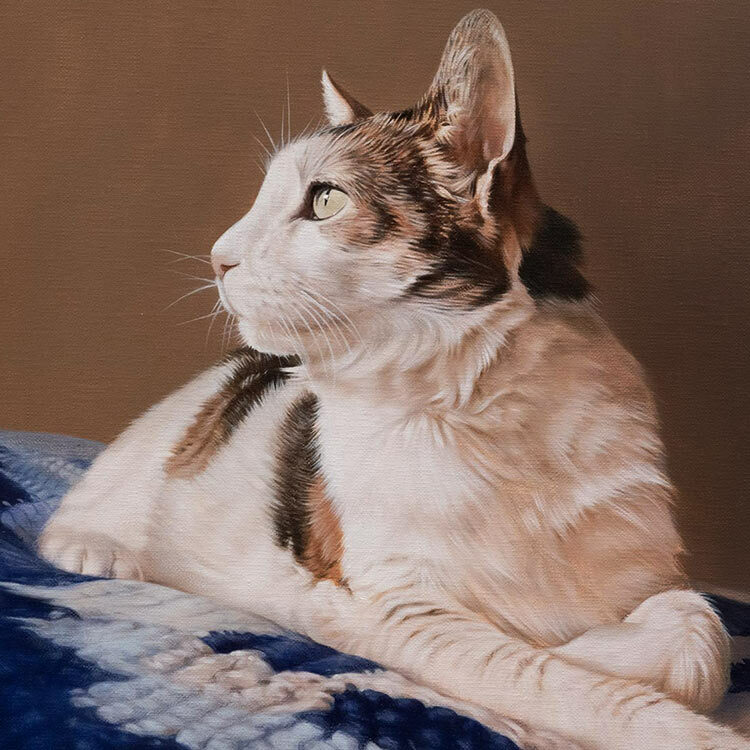 I was very loathe to actually leave the painting itself with the framer – it felt like I had left Tobi herself there when she should have been at home with me. 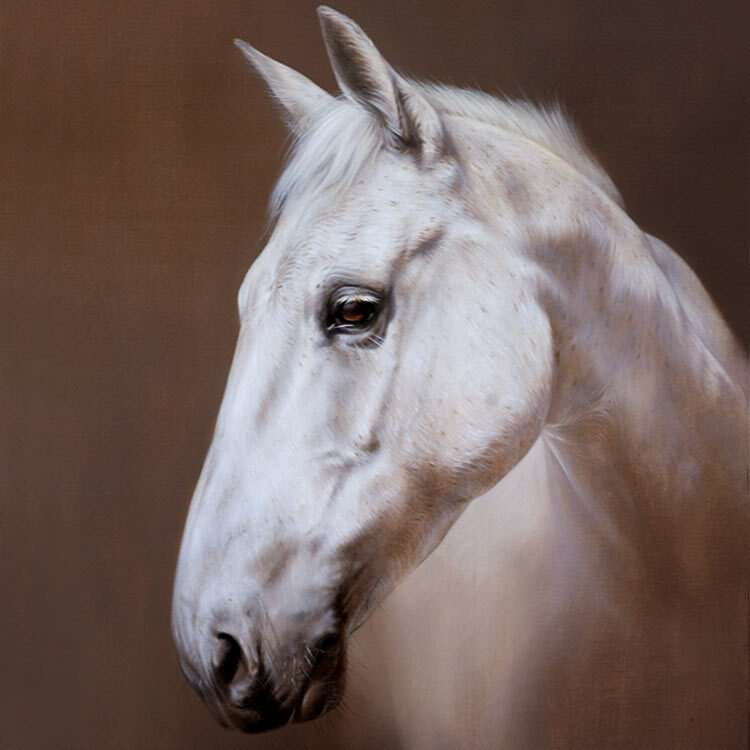 I cannot compliment you enough for the portrait- I am so overawed at how well you have captured all the essential elements of my adored pet’s face, bringing her ‘back to life’. You and Nick both have an amazing gift with your abilities to capture the essence of people’s precious animal family members. I now have my Tobi portrait back and beautifully framed. I was very anxious that the framing I had chosen with a lot of help from the framer would be too heavy or not do the portrait justice. But I was thrilled with it. When the framer brought it out and showed me how it looked, I cried. Your image of Tobi is so real that it was as if she were there alive in front of me. It also reminded me how much I miss her everyday. Now, like a strange old demented person some might think, I talk to her portrait each time I pass and it makes me feel better about her absence from my life. The outside frame is a deep rich brown with a slight grain through it and a mottled rich gold edge and the inside frame is a linen finish with pale gold edge. The framer recommended a frame inside a frame – I love the effect. I have had ‘fun’ taking photos of the portrait – trying not to get reflections from the flash, finding the right natural light that shows the colours as close to reality as possible and using the self-timer, then racing across the room to get the photo of me with the painting. I must have taken about 100 – I am a bit of a perfectionist and didn’t want any photo that didn’t do the portrait justice. The one of the painting by itself is a little bit too yellow, but I have had trouble getting the exact colour right. I have had to rotate and crop some of the images with me in it, as I think I must have leant on the corner of the frame as I raced into position and made it hang crooked in the photos. However, I have made them as good as I can, operating on my own – my partner Kevin would not have put up with taking as many photos as I did. I have shown your website to everyone who will listen to me. It has been marvellous to be able to see the stages that the portrait went through to reach completion. I really liked some of the early stages, particularly the one shown on the blog on Jul 7th, as well as the final image. I have had a look at your dog portrait website and must thank you for putting an image of Tobi’s portrait there – she would love to know that she had been ‘recognised’ in some way. I hope you feel the photos do your work appropriate justice.